Bring your quilts to life with animal appliques that frisk and frolic on backgrounds of vibrant patchwork. 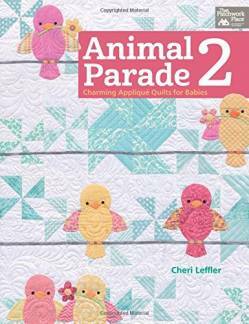 Quilters everywhere fell in love with the adorable patterns in Cheri Leffler's "Animal Parade. "Now she's back with even more delightful designs for the young--and young at heart.10 charming baby quilts combine simple piecing with appliqueStep-by-step instructions for needle-turn and fusible-web applique--full-sized patterns are includedCreate lovable gifts featuring turtles, rabbits, pandas, elephants, raccoons, and more ..."